Soul Caibur 4: Was it a good move adding Yoda and Vader as guests to Soul Caibur? This was the biggest question for Soul Calibur 4. And rightfully so since obviously lightsabers trumps metal swords. But of course this is video games. We all have cross overs of different platforms that we would love to go head to head with. But this was kind of pushing the envelope a bit much. I saw that because Sould Calibur is not the only fighting game that has guests fighters and it works beautifull. Like when mortal Kombat added Kratos or Super Smash Bros adding Sonic. Some fights between the characters we love we would love to animate ourselves. With just the two examples I mentioned those are rather at least decent additions to make you execited to getting the game. And Adding Yoda and Darth Vader to Soul Calibur 4 put more of a question mark above my head. Even with the addition of Star Killer from Force Unleashed as as one of the Soul Calibur 4 unlockable characters. Yes it was a great way to debut the new Star Wars game at the time but still lightsabers vs swords???? You get my point. Shoot Soul Calibur 4 could have Ryu Hayabusa a special guest and called it a day. Ryu vs Mitsurugi. Talim vs Ayane. That seems fair right? One of the best values of Soul Calibur is the replay value. Even more so with this game since online game play is incorporated into the game. Me personally I kinda missed weapon master mode from Soul Calibur 2. But I guess not to many of you out there missed it as much as I did since that wasn’t perserved in this game title. But the new thing is there was equipment damage added to the gameplay. Which I think everyone enjoyed for it made battle that more realistic. But the critical finish addition I don’t think was necessary. None the less the moves have improved just the same. Although like many of you who were alive when the earlier versions of your favorite fighting game you find yourself not playing with your original playing characters due to physics or what have you. I’m a big Talim fan. 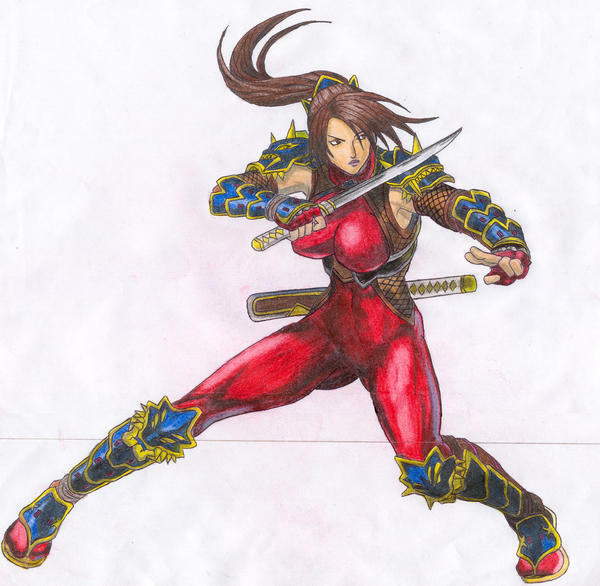 I enjoy her fighting style, agility and maneuverability. But this experience is based upon playing Soul Calibur 2. Soul Calibur 4 however almost discouraged me from playing with Talim. And then I found myself playing with Taki. Which I admit Taki’s moves are epic. One thing you can count on is the soundtracks Soul Calibur has. I enjoyed all the soundtrakcs thus far from this franchise. Especially when you creat epic memoriable moments during a song, when you hear it again it brings back those moments and you can’t help but smile. Or practice your evil laugh as you destroy your enemies with Soul Edge. One thing too I will cover more in depth is the effort and budget these gaming companies are putting into these video games. And here’s the link to the Soul Calibur 4 ost. The customization has been great and I only wish I had taken picture of peoples’ customized characters. I do recall someone using Mitsurugi as a template for Sephiroth. Which I thought was epic. I mean long silver hair and all….on top of me being completely owned by this guy or girl I played against online. Also, certain characters were exclusive to which console you had. So if you had the Soul Calibur Ps3 version you got Darth Vader and likewise for Xbox you got Yoda. Which seemed fitting since Yoda is green and Xbox has a green color scheme logo. Soul Calibur has come a long way since the original, from graphics, gameplay, characters, physics, responsive environments and character custumization. Since Soul Calibur 5 has already been releseased you already know what it’s about. But will franchise keep going up 10 maybe? It owuld be nice if the title came with a sub title or something but I’m not sure how that would work. What do you think? Leave your comments below on what you think would be a great sub title for Soul Calibur instead of just using numbers. Regardless, Soul Calibur 4 definitely earned its place amoung other great fighting games.